The Best of Teacher Entrepreneurs: English Language Arts – “Comprehension & Writing Activity: Presenting the Academic Awards for Literature"
English Language Arts – “Comprehension & Writing Activity: Presenting the Academic Awards for Literature"
Hook the students' interest about the Academy Awards. 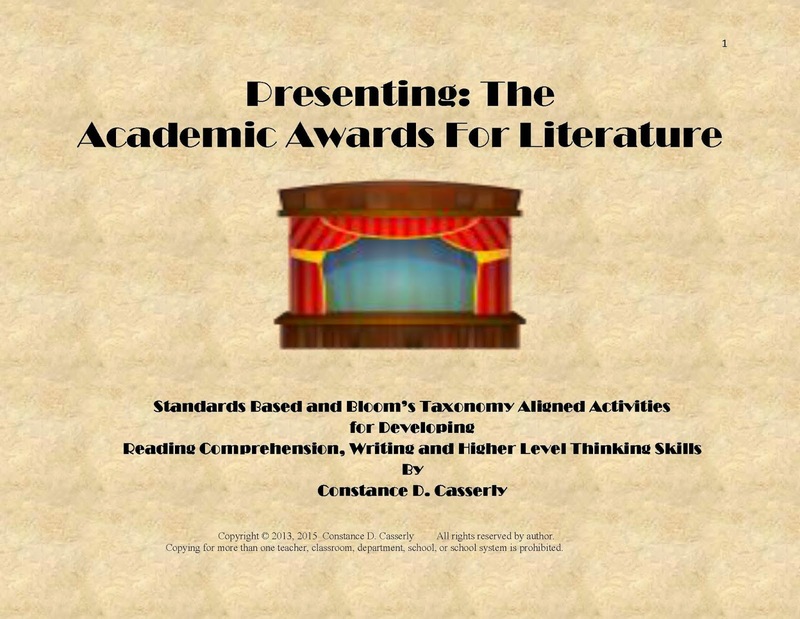 For this activity, Presenting the Academic Awards for Literature, the students' mission is to choose the best literature, from both fiction and non-fiction, for this year’s awards. The categories for the awards are based on the elements of literature (characters, settings, plots/conflicts, symbols, themes and point of views). 1. Write the Category title and your Choice for the Best in that category in the given spaces on the certificate. 2. Under that information on the awards certificate, explain and support your choice in a paragraph, following the points under Writing Criteria. 3. Make sure that your writing specifically addresses the criteria for each category. 4. After the writing segment is finished, you will defend one or more of your selections during a class discussion. The criteria for Fiction and Non-fiction offers students points to ponder about each element of literature as they consider how to explain the who, what, where, when and why behind their choices. Example: Characters (Types of characters are in the parentheses): Does the character grow and change (dynamic), show different sides to his/her personality (round), stay one-dimensional in his/her personality (flat) or show no mental/emotional and/or spiritual growth (static)? Is the character: major, minor, the protagonist or the antagonist? Are the characters believable and or sympathetic? Do you care what happens to them? For their explanation paragraphs, students must state the award recipient and the title and author of the text. To defend their choices, the explanation must include three examples along with supporting details that justify each choice and that add clarity to the reasoning behind it. The Teacher Notes page lists the Common Core Standards that pertain to this activity as well as the Bloom's Taxonomy terms students will utilize.